arlier I asked what people do for their holiday decor, themed trees? colored vs white lights? Hubby and I have compromised, he loves colored lights and I prefer the simplicity of white lights. So we have colored lights on our Christmas tree, and white for anything else. 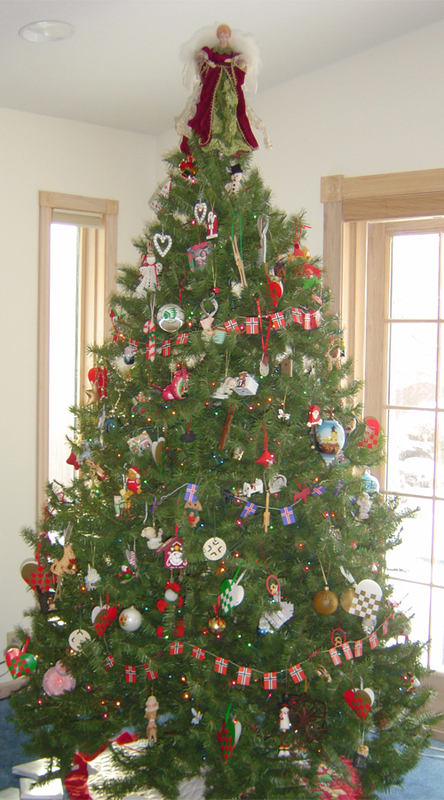 We don't have a themed tree, rather it's a collection of ornaments from our childhoods, and our lives together. Due to my Icelandic heritage and his Norwegian and Swedish heritage, many of our ornaments and decorating elements are Scandinavian. We have two pencil trees that I used to use on our front porch that in future years I'd like to set up flanking the entrance to the family room with all our Scandinavian ornaments and garlands on them. I ran out of time to set them up for this year. Pretty! I hope you have more time next year to enjoy it more. Oh my, I love your tree. In fact, with what you DID have time to do this year has inspired me to do more next year. I am thinking of starting my decorating on November 1st. Maybe I will get everything done in time! Here's hoping that next year you will have time to do more of what you want to do. /hugs and Happy New Year my friend.